Note: Quail School Media is proud to announce the launch of Quail School Press! Buy our critically acclaimed series from Amazon — and check out all the press and praise the first book received! Looking for a great copywriter? Need an editor who sees both the big picture and the small details? You’ve found the right bird. 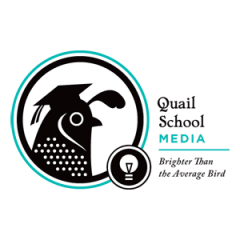 Why should you hire Quail School Media for your freelance writing and editing needs? Our staff have worked with private companies, nonprofits, state agencies — you name it. We’ve written press releases, website copy, speeches, newsletters, book promotional copy, blog posts, applications that have won international awards, and more. We’re familiar with both AP Style and the Chicago Manual of Style. We’re located in Austin, Texas, but can handle almost any project remotely. Whether your writing project is big or small, we can help you make it clear, concise, and consistent. Don’t get your feathers ruffled by bad writing. Contact us today. Quail School Media: Brighter Than the Average Bird.